A troubling freeway shooting occurred in broad daylight Wednesday just a block away from The California Highway Patrol's Redwood City office. Bullets fired from southbound Highway 101 around 10:40 a.m. managed to hit a series of cars at Peninsula INFINITI car dealership on Convention Way. At that hour, people were milling about car shopping and having their vehicles services. One employee said he was shaken up after hearing rapid gunfire. A witness, Jeff Weintraub, agreed, especially after Sunday’s mass shooting in Las Vegas claimed at least 58 lives. “It's super scary and it's more gun violence in this country,” Weintraub, of Redwood City, said of the drive-by shooting. CHP officers say two suspects, who may have been driving a four-door silver sedan, fired six shots towards the dealership, which is located off a frontage road near the Whipple Avenue on-ramp. “We're living in kooky times in this country. It's like anything goes,” Weintraub said. No one was hurt, but officers say three cars were damaged. Photographs from the scene show it was blocked off with crime tape while vehicles were pockmarked with bullet holes. “Thank God nobody was hurt,” Fransen said. 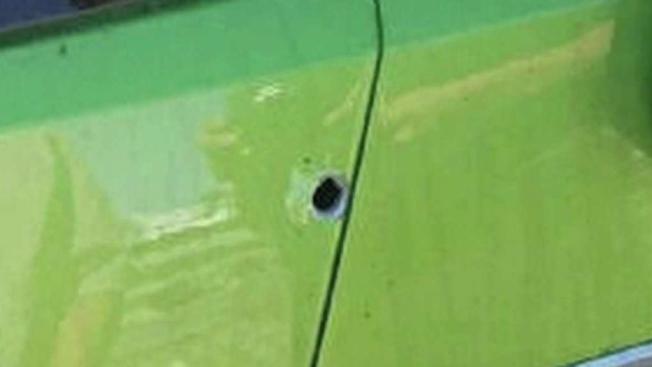 The CHP doesn't know if the car dealership was the target or if the shooting was random. Dimitri Petrovsky who owns a dealership nearby is on edge. “It came as a big surprise. Generally this area is pretty quiet,” he said. People who witnessed the shooting or have any information about the crime are asked to call the CHP.